Eventually, freshmen are going to have to venture out of the cocoon that is dorm life and enter the world of apartment hunting. It is stressful, overwhelming, and downright irritating at times. With that being said, have no fear. These 4 tips will make your navigation around Madison housing less painful. Start early. But really, think of a month you’d like to start looking for your first apartment, then start a month earlier than that. In a college town, the best apartment buildings fill up fast and you want to optimize your options. It gives you time to check off all your “wants” in an apartment, and not be forced to settle for the very last available option (take it from somebody with firsthand experience of apartment procrastination). 2. Choose your roommates wisely. Sometimes living with your best friend sounds like a great idea, but I’ve noticed that your best friend may not always make the best roommate. Make sure you find somebody compatible with your daily habits, and who will perhaps pick up on the chores you slack at while you carry the chores you are good at. 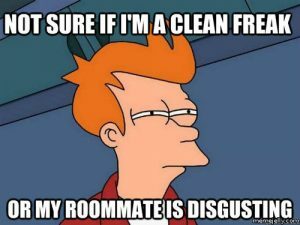 You and your roommates should be a well oiled machine, so choose the pieces to that machine with care and consideration. 3. Landlords make or break your experience. It may sound like signing with the nicest apartment with the top notch amenities is the best thing, but a crappy landlord (or management company) can ruin it all. It’s like with classes, a professor can make or break your classroom experience. Do your research and meet with the landlords before signing any papers. 4. Live in a house at least once. This is a random (but important) tip. Although they usually aren’t furnished and there are extra responsibilities, it is a special experience everybody should have once in college. Not to mention, rent is usually cheaper… your parents will thank you.